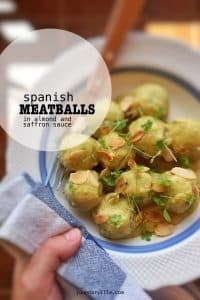 Meatballs in Almond Sauce with Saffron | Simple. Tasty. Good. Both the hubs and me love meatballs. You bet I always keep a stash of them in my freezer because whenever I see any kind of meat mince for a bargain at my supermarket I will take it home, make meatballs or burgers and freeze them for later. So since we eat meatballs regularly I’m always looking for some interesting sauces to keep our dinner inspiring and yummy. These meatballs in almond sauce with saffron is based on a Spanish classic ‘albóndigas en salsa de almendras”. Love meatball recipes? Then also check out my highly popular creamy carbonara sauce meatballs! 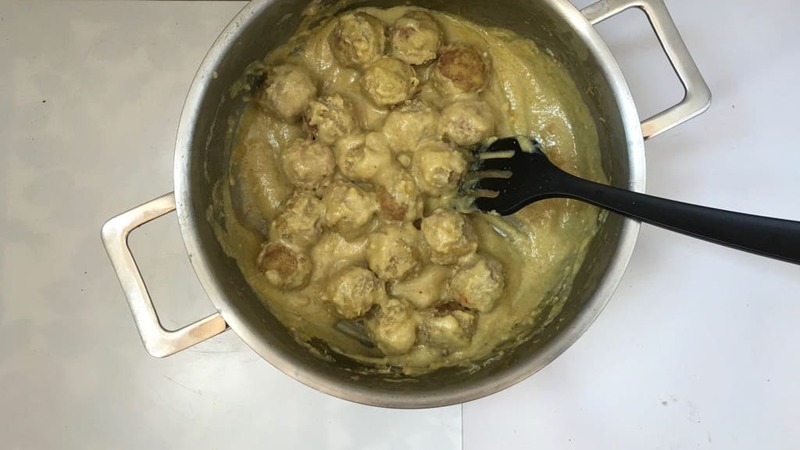 Or hwo about some homemade Ikea style Swedish meatballs… I got an extensive meatball chapter here on my website if you like some more recipe ideas! 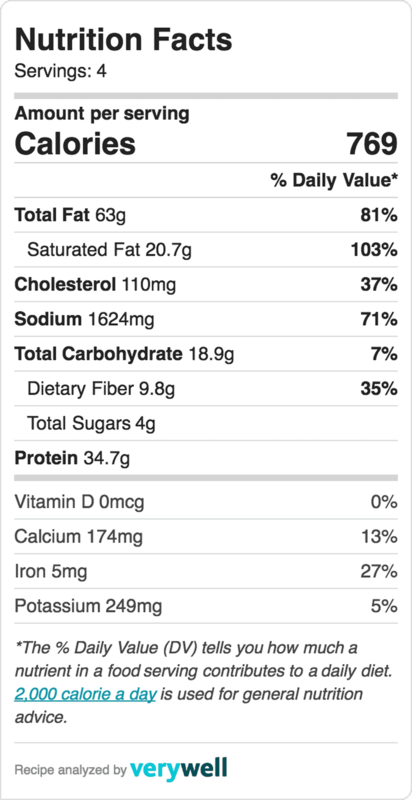 Fond of almonds? Then you surely will love my romesco sauce for prawns and grilled vegetables! Or how about a Spanish cold almond and garlic soup with grapes aka ajo blanco? Maybe you are more into desserts: Italian almond amaretti cookies, almond meringue cupcakes or a classic frangipane cake… Check them out! 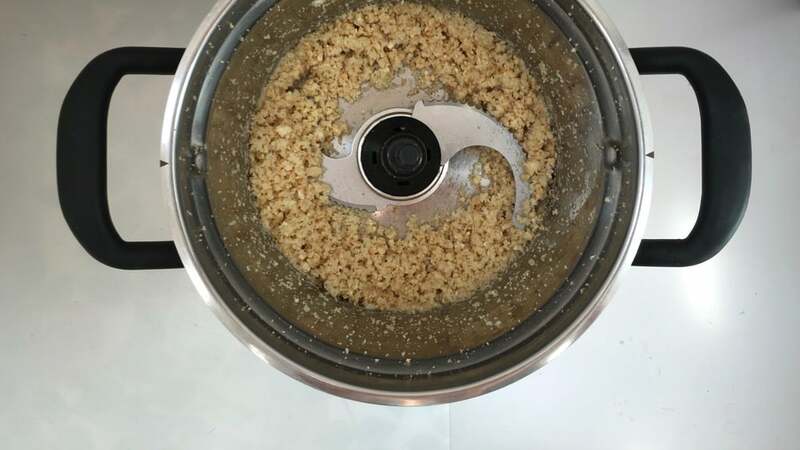 Add the onion, garlic cloves, almonds and bread to a blender. Pulse the ingredients for 20 to 25 seconds until everything is chopped up finely. Pour the olive oil in a large pan, add the crumbled bread and almonds and place the pan over medium-high heat. Season with a pinch of pepper, salt and nutmeg. 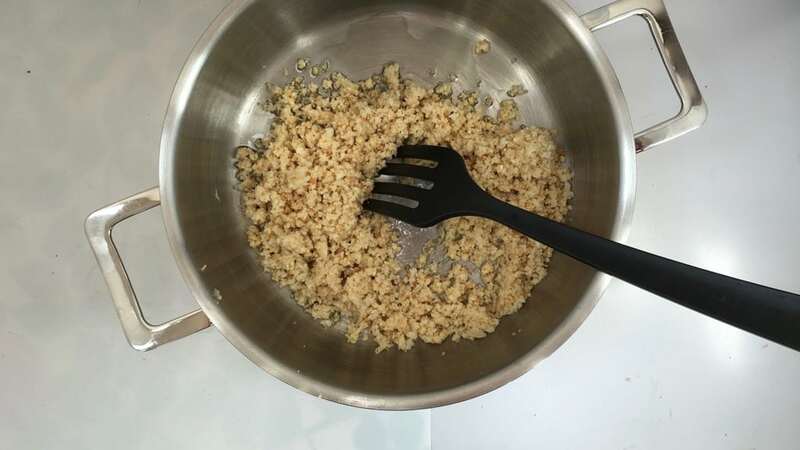 Stir the crumble and bake it for 5 minutes. Then add the chicken stock and bay leaves. Stir well and cover the pan. Bring the mixture to a good boil. Then turn the heat lower and simmer the sauce for 10 minutes. 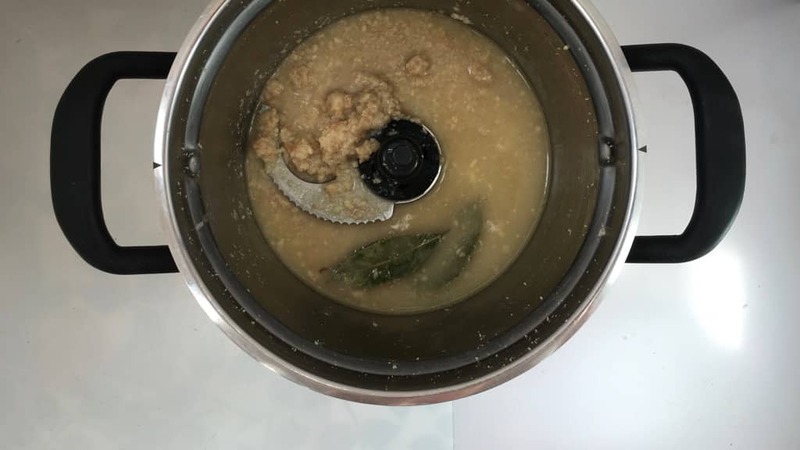 After that remove the bay leaves and pour the almond mixture in a blender (or mix the sauce using a stick mixer). Pulse for 25 seconds until the almond sauce looks pale and creamy. Pour the sauce back into the pan. Add the meatballs and the soaked saffron and saffron water. Stir well and bring the sauce and meatballs to a light simmer. Let the meatballs cook in the sauce for 20 minutes until cooked through. In the end check the seasoning of the sauce and add extra pepper, salt or nutmeg to taste if necessary. 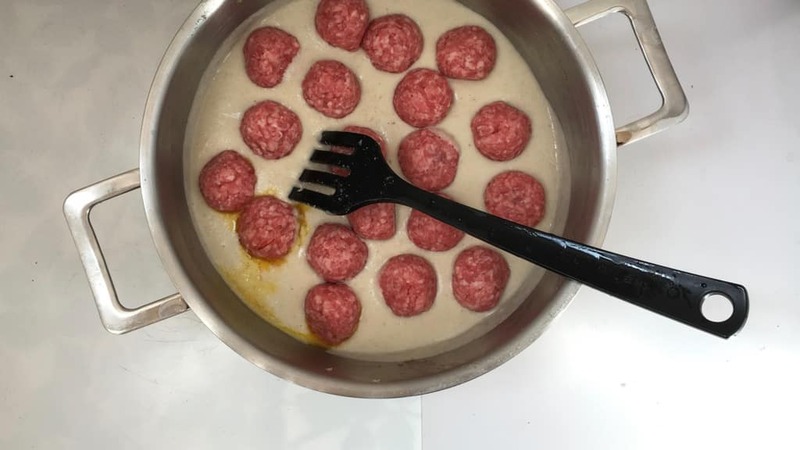 If the sauce is too thick, add extra milk or water and cook the meatballs for 5 more minutes. Scoop the meatballs onto plates and sprinkle with the toasted shaved almonds. Serve hot. This recipe is another great match for my KitchenAid Cook Processor: meatballs in almonds saffron sauce! Love the fact that I can blend, cook and blend the sauce all in one go without having to switch between pan and blender. I rolled small meatballs, each weighing a little less than 1 ½ oz (45 g) which was enough to feed 4 people. Serve the meatballs with cooked rice or grilled bread and a crisp arugula salad. 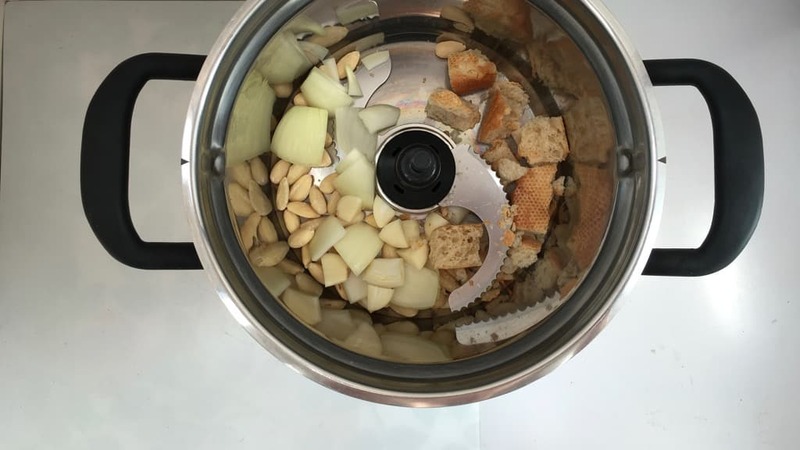 Add the onion, garlic cloves, almonds and bread to the bowl of the Cook Processor fitter with the MultiBlade. Close the bowl and press Pulse for 20 to 25 seconds until the ingredients are chopped finely. Then pour in the chicken stock, the olive oil, the bay leaves and a good dash of pepper, salt and nutmeg. Leave the MultiBlade in the bowl. 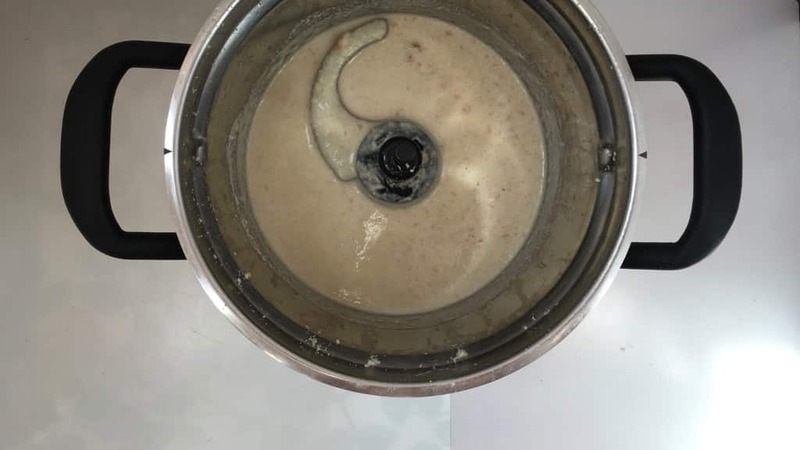 Close the bowl again and select BOIL P1. Press Start to activate the program. When the program is finished, press Cancel to exit the keep warm mode. Remove the bay leaves. Then press Pulse for 20 to 25 seconds until the almond sauce looks pale and creamy. Then remove the MultiBlade and replace it by the StirAssist. Add the meatballs to the sauce and pour in the soaked saffron and saffron water as well. 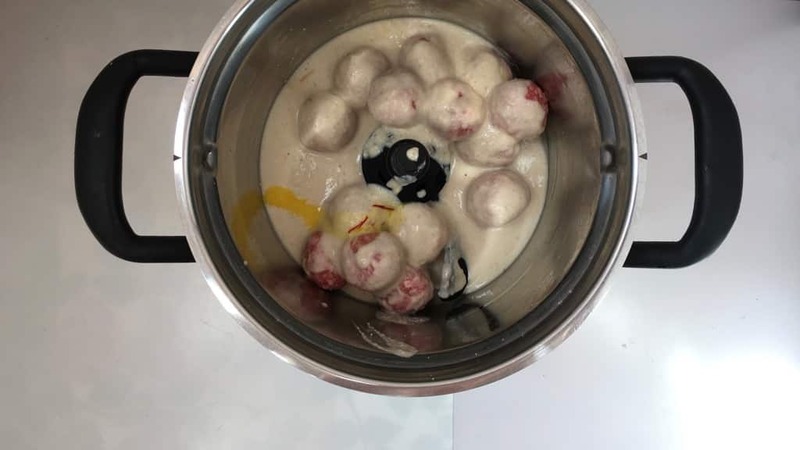 Close the bowl and select BOIL P1 again. Press Start to activate the program and reduce the speed to 1. Let the meatballs cook in the sauce. Then press Cancel to exit the keep warm mode. Check the seasoning of the sauce and add extra pepper, salt or nutmeg to taste if necessary. 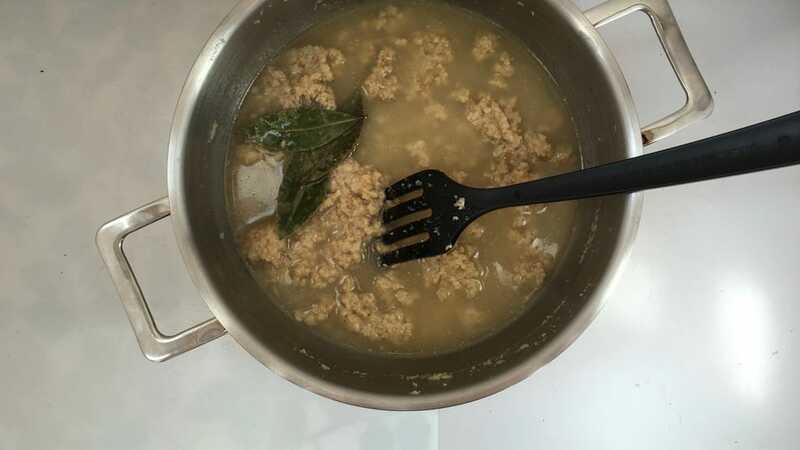 If the sauce is too thick, add extra milk or water and cook the meatballs for 5 more minutes. Scoop the meatballs onto plates and sprinkle with the toasted shaved almonds. Serve hot.